There are few SUVs on the Indian roads as imperious as the good old Toyota Fortuner. Although there is a range of more sophisticated full-sized off-roaders at your disposal, none seem quite as capable at yanking a small moon out of orbit as Toyota’s tank-like SUV. While most large SUVs ceased to resist gentrification, the Fortuner remained defiantly rugged which caused a share of the customer base to look for more ergonomic options. This included having an automatic gearbox which wasn’t available on the AWD Fortuner up until recently. 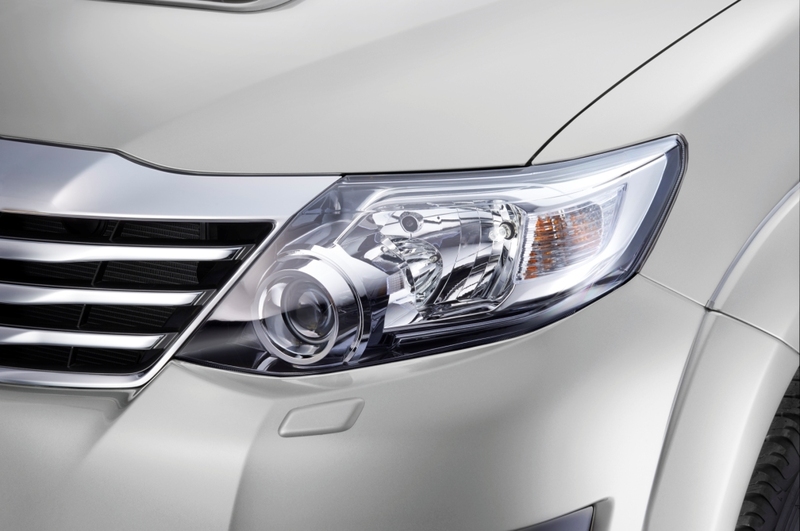 Now equipped with one, we’re here to study just how complete an SUV the 2015 Fortuner is. It retains the same ground clearance, diff locks and transfer case as the regular Fortuner 4×4, now with the luxury of an automatic box and a few visual upgrades. Smoked headlamps and tail lamps are all fine, but what really lends character to its aesthetic profile are the matte black 12 spoke alloys which add a dash of urban chic to its demolition derby musculature. The interiors get an all-black leather treatment which never fails to up the quality quotient – you won’t find multi-platinum rapper levels of opulence here, but it is remarkably comfortable and premium in here. 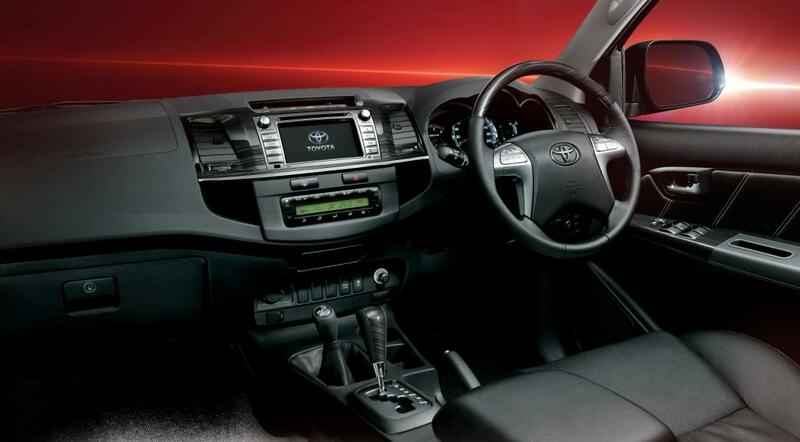 The dash gets some bits of black as well, to compliment the trim, along with a neat touchscreen unit housed in the centre, equipped with voice recognition and SatNav to go with Bluetooth and all the other multimedia staples. The driver seat also gets an electronic adjustment mechanism. We now come to the party piece – the ‘auto box. I had some trepidation about the contraption and the finesse with which it will be able to carry 34 mountain mowing kgm of torque that the car packs. The first time I buried the accelerator, I winced in anticipation of the transmission lag, but none was to be found. Slot it into D mode and the 3.0 litre D-4D turbo-diesel makes a smooth transition towards higher speeds thanks to 168 bhp of power. Shifts aren’t lightning quick, but they are extremely smooth and relatively well spaced – significantly better than anything its immediate competitors have. For a car that weighs two tonnes, it is genuinely remarkable just how fast even a fully loaded Fortuner can seem, not to mention the ease with which it brakes despite having drums at the back. Thanks to its double-wishbone suspension setup and its high-profile tyres, the car offers a very supple ride quality which isn’t surprising given that portholes are mere trifles for those tyres. It is also fairly efficient with an ARAI claimed 11.9 kpl figure. I’ve never quite understood the preference that large SUVs seem to get, but the approach angles on this vehicle offer some explanation. Going over rocky surfaces is just too easy with the Fortuner – it’s precisely then you start to figure out just why it’s the weapon of choice for cross-country drivers. It hasn’t abandoned any of its true off-roading attributes in exchange for more city friendly mannerisms and this makes it refreshingly fun and fulfilling to drive in the mountains. The 2015 Fortuner 4×4 AT is the most complete, entry level luxury SUV you will find, at least until the new Fortuner arrives, which will find an equally competent rival in the Ford Endeavour. It allows you to dispense with any terrain related concerns, while being incomparably spacious and idiot-proof. Which explains its Rs 27.82 (Ex-Delhi) price tag. Rest assured, if there’s anything spot of off-roading worth doing, it’s worth doing it in the Fortuner.